The deep seated passion for building no-compromise Alloy power boats runs through the veins of AMF management, a philosophy that you can see in the finished product. Started by Paul Sharratt in March 1984 with the intention of building heavy duty Aluminium boats, it took a some time to get the first boats sold and a couple of years before the AMF name was established and the boats started selling on their merits, with the common phrase “overbuilt” often being used by customers. 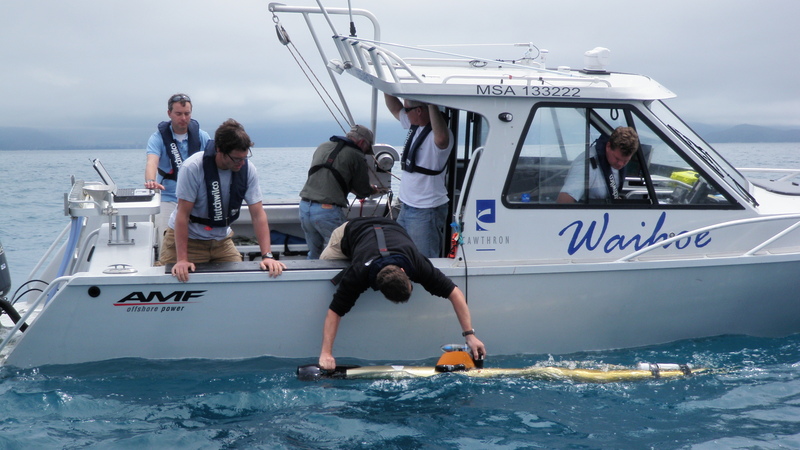 There has been four premises changes in the 30 years, Courtney Road in Tauranga, then out to Te Puke, Hewletts Road Mt Maunganui and then the merger which now sees AMF Boat Company Ltd based in the river city of Wanganui. We had very little gear or money but we had time so we built the bending and rolling machines ourselves with some second hand parts – these are still in use today. Technology has changed dramatically since the 80’s, and it has changed the way we do business, AMF once sold a boat to a car salesman in Auckland via MSN chat alone. AMF has led the way in Aluminium boat building and developed many of the construction techniques used today. We sell on line and we now buy on line too. We had one of the very first typewriters with a screen that showed you about three words, and had a tiny memory. Although there were times back then that we could not afford a new ribbon for it so had to rewind and re-ink the old one manually. The invention of the web and websites has taken AMF to a global market landing offshore contracts that AMF could only dream of some time ago. Paul Sharratt was working for Doug Wilde at Wanganui Boats when he and his wife Margaret decided to move the family to Tauranga, it was then Paul ran with the idea of starting his own Aluminium boat building business. It was early days for Aluminium in the 80’s and a huge amount of development was done, in conjunction with Brian Collings who owned Rivercity Marine (Est 1981) in Wanganui, much of the testing was done on the Wanganui bar, and the need for increased hull strength, performance and depth became clear, make the sides higher and make it stronger! Paul was also obsessed with making the boats go as fast as possible so the need for a superior non-pounding hull shape that did not deteriorate over time was paramount. Now 30 years on, AMF has an enviable reputation at being one of the best Aluminium boat manufacturers in the world, they are re-noun for building the toughest Aluminium boats available, and producing one-off special design and build projects that are successful throughout all aspects of the vessel. AMF construct their Aluminium hulls to have a service life of 25-30 years, retaining the shape resulting in hull performance being consistent over its life time. 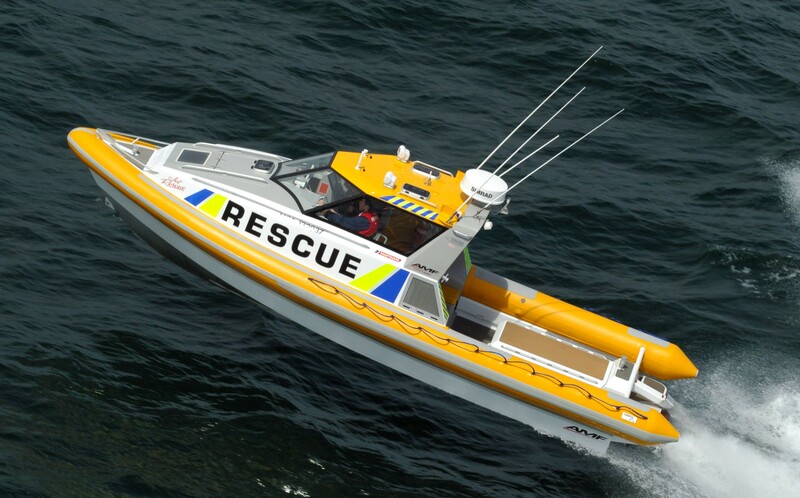 Expanding the size range up to 14M has opened up another market area for AMF, and with the diversity of the range spanning initially from bull bars to barges, it now reaches from sport fishing boats, to superyacht tenders through to search and rescue vessels. The team started with Paul Sharratt working alone, with daughter Jodi helping after school and on weekends until she left school and started working full time on the factory floor with Paul. Over time AMF had a small number of staff, only ever up to around six or seven in total. Brian Collings purchased the Pro Sport series from Paul in the 90’s, and then in the 2009 purchased the entire business from Paul and Jodi. The business, which had two branches, one in Tauranga and one in Wanganui, merged in 2011 and is now based solely in Wanganui and employs 12 full time staff, along with contractors helping out when required. Jodi is still working in the business with husband Brian, and Paul, at 70 years of age, is finally building his own boat and investigating semi-retirement. AMF is focusing mainly on a more international commercial market but still retains local enthusiasts with the ever popular Pro Sport recreational series, mainly because they are built no different from the commercial boats – over built! A cult following is definitely well established within New Zealand particularly in the Pro Sport series with one of our owners going so far as to have AMF tattooed on himself, and establishing the AMF Annual Fishing and Diving competition based in New Plymouth. Word of mouth in the AMF world is our best promoters, like the brochure says “it’s not for everyone”. We have a rather large AMF family now, that is the best part about being personally involved in each build is getting to know the person and their families, we have made many lifelong friends. Having customers who have had up to four AMF boats and others having owned more than one at a time, just because they can, is a large source of inspiration for AMF. Considered a solid investment, AMF boats are often on-sold at a higher price than what they were purchased for, which confirms the value for money at the time of the initial purchase. 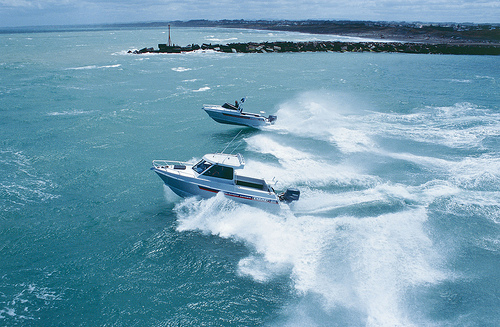 With the main business focus on the international RIB market, AMF aim to increase production, with larger premises sort, would like to make Wanganui one of New Zealand’s leading boat building precincts employing locally skilled people and producing exceptionally high quality, high preforming, long lasting vessels. AMF has always been a family affair, with Paul Sharratt starting the business, daughter Jodi working alongside Paul and then with husband Brian Collings and his son Bevan Collings, it has already spanned two generations, and with plenty of grandchildren now in the picture who knows, maybe a third! AMF are well positioned to supply discerning clients both here and overseas as their company continues to expand in the coming years.